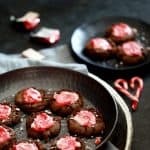 Look no further for the perfect cookie for any winter holiday celebration than these Mocha Peppermint Crunch Cookies! 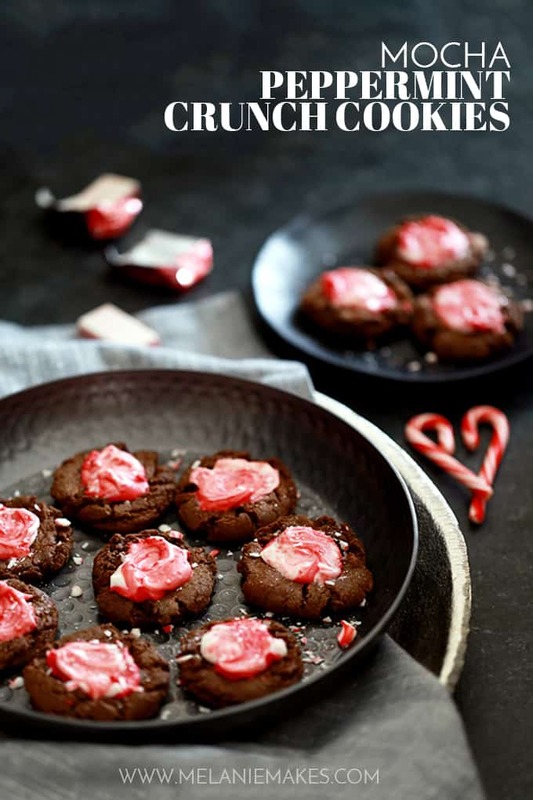 A soft and chewy espresso infused chocolate cookie is topped with a puddle of peppermint crunch candy before being showered with crushed candy cane. Want to know what I did this past weekend? I made 13 dozen of these Mocha Peppermint Crunch Cookies. No biggie, right? Typically I’d never in a bijillion years make that many cookies at one time, but I have a Christmas cookie exchange party to attend this week and I knew if I didn’t do my baking over the weekend, it would never happen. Now, don’t close your browser tab and walk away at the thought of that many cookies. Not only do these cookies fall on the easy end of the baking spectrum – no rolling! no cutting! – but the recipe is also easy to halve as well. You know, just in case your cookie jar won’t fit 156 cookies. These Mocha Peppermint Crunch Cookies were inspired by a recipe that I found in my e-mail archives. I have a recipe folder in my e-mail that I’ll throw recipes that people will send me and I have no recollection of ever receiving the original recipe from my cousin way back in 2010. And per usual, I couldn’t leave well enough alone and put my own spin on things. I spiked the original cookie base with coffee and instant espresso and swapped the candy that was called for on top with a peppermint crunch variety. Winner winner, I love cookies for dinner! An absolute fact. I mean, I do love me a peppermint flavored dessert. Peppermint + chocolate = a winning combination in my book. 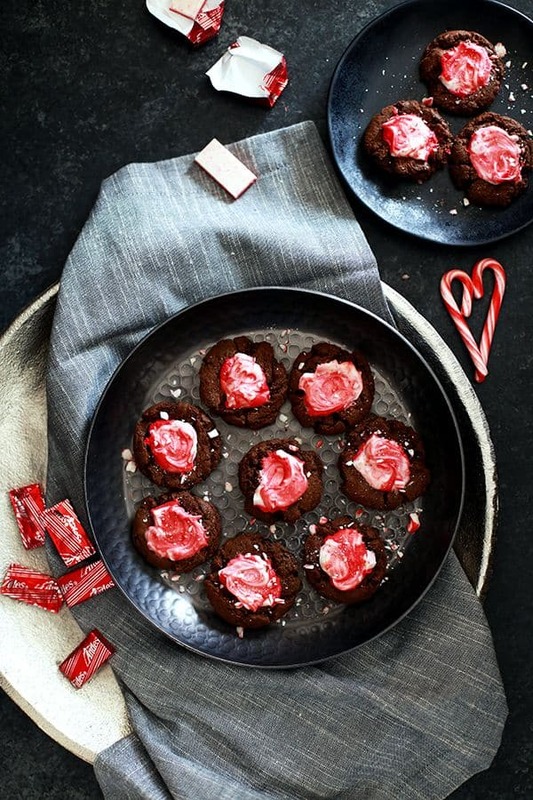 Like my addictive Peppermint Bark Brownie Bites, decadent Triple Chocolate Peppermint Skillet Cookie and beyond easy No Bake Oreo Dark Chocolate Peppermint Cheesecake. One of my favorite things about this recipe is that the dough can be made ahead of time and chilled prior to baking time. Another plus? These cookies freeze like a dream, meaning that the cookies that I made over the weekend are in the freezer and awaiting their debut come party time later this week. I’ll simply bring them out early in the day and allow them to come to room temperature prior to party time. 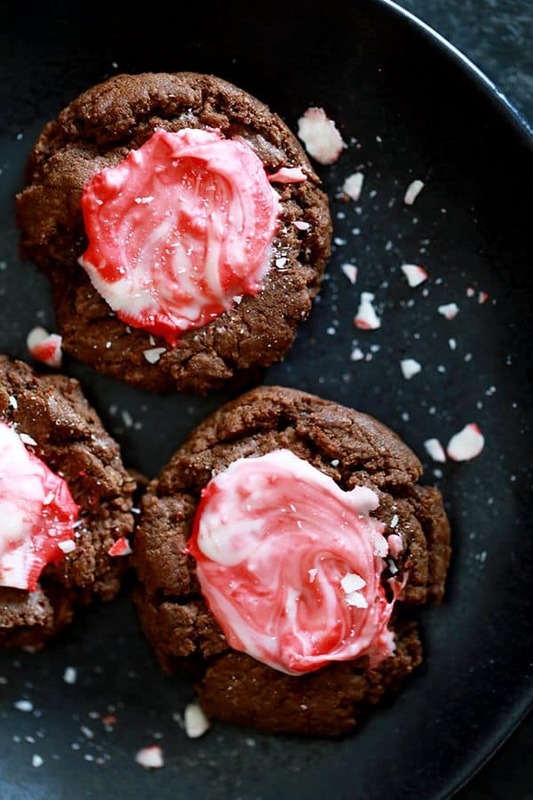 Chocolate and peppermint is such a winning holiday combination and these Mocha Peppermint Crunch Cookies are no exception. The fact that they not only taste delicious but are also easy on the eyes make them a definite cookie exchange champion contender in my book! In a medium saucepan over medium-low heat, stir together butter, sugar and brewed coffee. Add bittersweet and dark chocolate chips and instant espresso powder and stir until melted and combined. Transfer mixture to bowl of an electric mixer. Add eggs, one at a time, and mix well after each addition until combined. Cover and chill at least one hour or as long as overnight. Using a tablespoon cookie scoop, place dough on parchment lined baking sheet. Remove cookies from oven and immediately place one unwrapped candy on the top of each cookie. Allow candy to melt and using the back of a spoon, swirl melted candy over top of cookie. 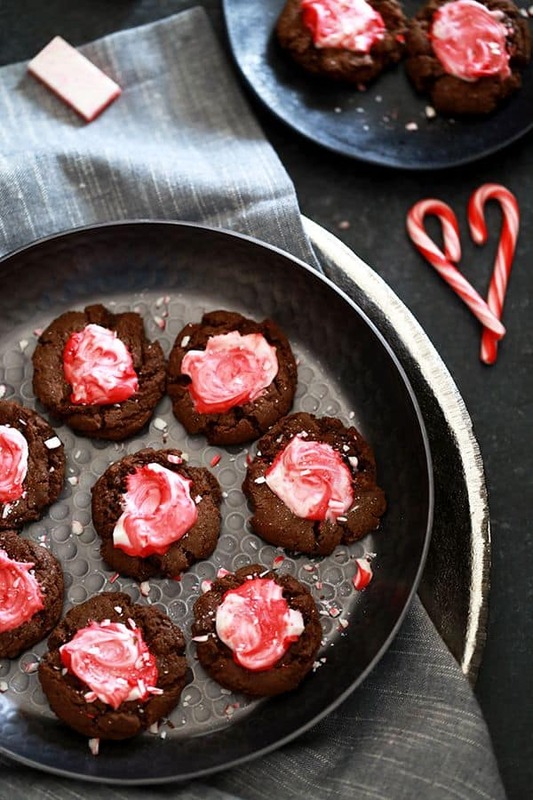 If desired, garnish still warm cookies with crushed candy cane. Looking to infuse a bit more peppermint into your desserts? Me too! You won’t want to miss this creamy Peppermint Chocolate Cheesecake, four ingredient Practically Perfect Peppermint Fudge and these light and airy Peppermint Snowcap Meringues. These just scream hello holiday season! I'd love a dozen. Pretty please. I think I am going to make these for a cookie exchange - do they keep well? These cookies are fabulous for holiday baking! These cookies sound amazing! They have Christmas all over them! Yum! These are the perfect Christmas cookie! Great for holiday baking! I add a recipe for these cookies to my favorites. I want to eat it every day! I'm sure this is very tasty. This is a great recipe for me. Oooh, those look positively delicious! Melanie! 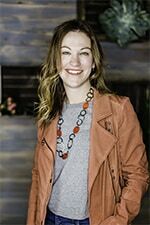 I totally laughed when I read about your cookie exchange! 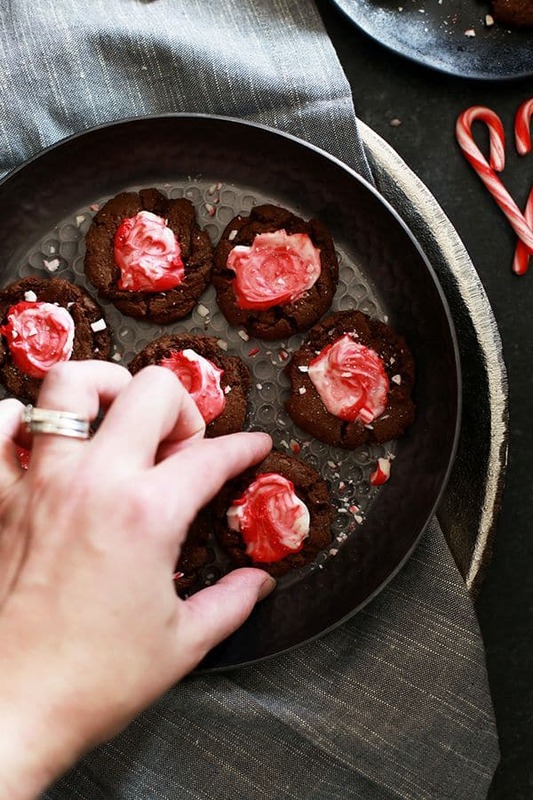 I did the same exact thing a few years ago with similar chocolate peppermint thumbprints. Gotta appreciate how easy these cookies really are. I'm in love with these flavors and that gorgeous center! I wanted to make some kind of joke about a baker's dozen but I kept getting stuck on 13 dozen. That's A LOT of cookies! What gorgeous, festive cookies! It's been a LONG time since I baked 156 cookies, but I'm so impressed that you did and that these turned out so beautifully! I hope everyone at the exchange loved them! These look fantastic. They have my name all over them. I love the addition of the mocha! I'll take my coffee anyway I can get it! I bet it makes the chocolate flavor really stand out!